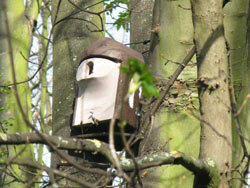 The bird and bat boxes went up in the wood yesterday. 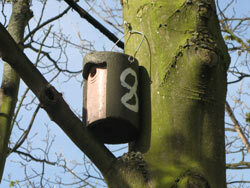 There are 16 in total: 10 bird boxes and 6 bat boxes. Each one has a number on the side to make it easily identifiable. 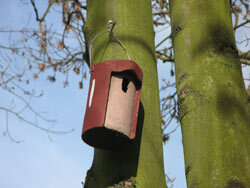 They are made from “woodcrete” which is a very durable material that is 75% wood. It has very good insulating properties and should protect any chicks from harsh weather. 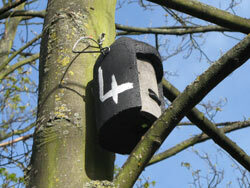 The difference in hole size makes them suitable for different types of bird and the bat boxes have holes like “number 4” above.